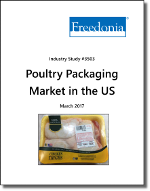 US poultry packaging demand will rise 3.6% yearly to $4.3 billion in 2021. Consumer preference for easy meal preparation will help to raise gains for poultry packaging overall, while in the fresh poultry market, increased use of individual portion packaging has spurred demand for vacuum pouches. The tray and overwrap packaging format is still the most widely used in the packaging of fresh poultry for retail sale. The fastest growing market for poultry packaging will be the small ready-to-eat poultry market. This Freedonia industry study offers historical demand data plus forecasts for 2021 by product, market and application. The study assesses technologies used in poultry packaging (MAP, vacuum, packaging, case-ready packaging, retort packaging, interactive labels, ITTs, susceptors, and moisture control packaging), evaluates company market share and competitive analysis on industry participants including Bemis, Berry Plastics, Georgia-Pacific, Graphic Packaging, International Paper, NOVIPAX, Packaging Corporation of America, Pactiv, Sealed Air, Viscofan Group, and WestRock.